127 Hours movie with James Franco as Aron Ralston: Between a rock and a hard place. When I initially heard that Danny Boyle and Simon Beaufoy, the Oscar-winning team behind Slumdog Millionaire, were adapting the real life story of Aron Ralston for the big screen – what became 127 Hours – I got excited. A movie seemed an inevitability when the story broke in the news and Ralston wrote a book about it, but I couldn't have imagined such a great filmmaking team actually working on it. When James Franco was cast as Ralston, my hopes hit a high. Franco is an underrated and remarkably talented actor unfortunately snubbed by most for his wonderful work in the 2008 releases Milk and Pineapple Express. Danny Boyle also happens to be a very skilled director, one whose style tends to be hyperkinetic. Although it worked beautifully in Slumdog Millionaire and Trainspotting, Boyle's touch unfortunately hinders, rather than enhances, the story being told in 127 Hours. The tale itself is so well known that to describe it would hardly be a spoiler. Aron Ralston is a guy who likes to go rock climbing and canyoneering. On one fateful expedition, a freak accident takes place when his right arm is crushed underneath a rock. Because 127 Hours has little in the way of action, as it essentially revolves around one man in a confined space for almost an hour and a half, every single piece has to come together in order for the film to be compelling – especially considering that we already know the outcome. A great deal of the movie works well, in no small part because James Franco creates a harrowingly real character. In fact, Franco's is one of the best performances of 2010; his recent Oscar nomination, I should add, was fully deserved. He portrays Ralston as a man who is slowly transformed over the course of his experience, going from a cocky and arrogant guy to someone more humble and understanding. One scene in particular, in which Franco / Ralston laments that he deserved to be in such an awful situation, really allowed me to feel for the character. No matter how cocky and arrogant, no one deserves that fate. James Franco in '127 Hours': Best Actor Oscar nomination. So my problem with 127 Hours stems mostly from Danny Boyle's direction and Jon Harris' editing. At first, as we see Aron Ralston biking and climbing his way to the fateful rock, Boyle's hyperkinetic style works quite well. That style, however, never really ceases, even after Ralston gets trapped. Boyle keeps resorting to fast jumps and cuts that seem totally out of sync with what's actually taking place on screen. Jon Harris' editing, for its part, only exacerbates this directorial flaw, much too often making me feel disconnected from the character's fate. In my view, a more minimalist approach – an approach to make me feel what it must have been like for Ralston – would have been more effective. I rarely felt the panic and terror he must have felt; I rarely felt the unavoidable claustrophobia; I never felt the plodding monotony that life must have been like for him during those five days. Having said that, it is just as true that 127 Hours has a lot going for it. As I mentioned above, James Franco's performance is fascinating, while Enrique Chediak and Anthony Dod Mantle's cinematography is at times beautiful, at times haunting, but always impressive. Additionally, Danny Boyle and Simon Beaufoy's screenplay mostly works; for instance, Ralston's flashbacks and fantasies during his ordeal are often quite touching. Ultimately, 127 Hours is a worthwhile effort. I recommend it because it offers moments that work quite well. Yet I cannot help but ponder on what could have made a film that is simply good into something truly great. 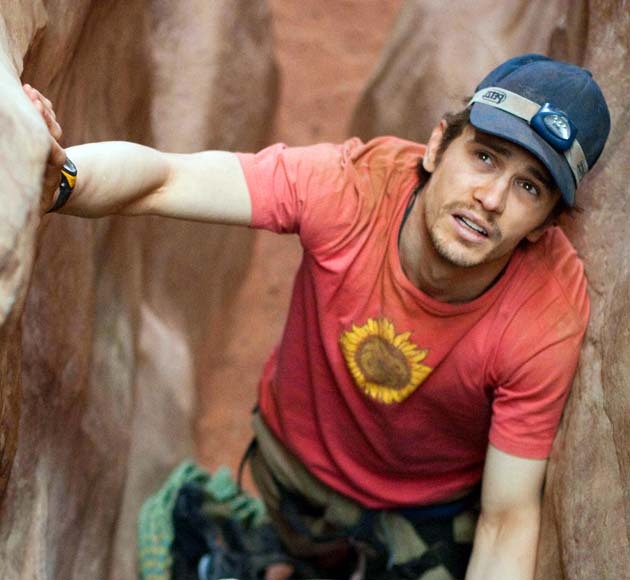 '127 Hours' trailer with James Franco. Scr. : Simon Beaufoy and Danny Boyle. From Aron Ralston's book Between a Rock and a Hard Place. Cast: James Franco. Kate Mara. Amber Tamblyn. John Bott. Treat Williams. John Lawrence. Kate Burton. Bailee Michelle Johnson. Brad Johnson. 127 Hours movie cast information via the IMDb. James Franco 127 Hours images: Chuck Zlotnick / Fox Searchlight. 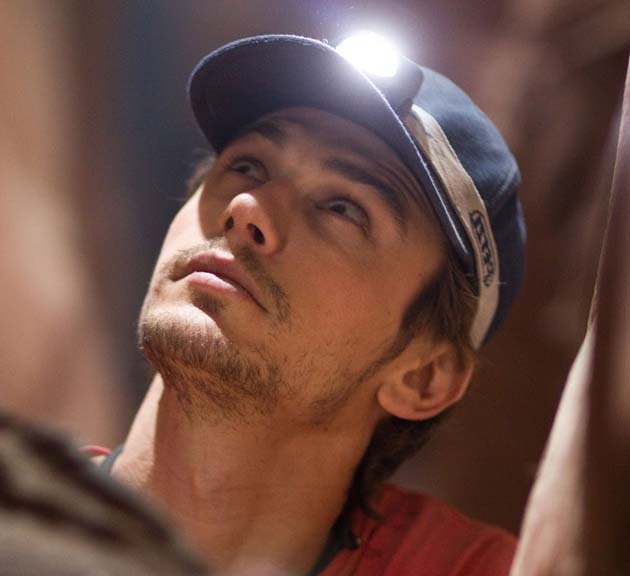 127 Hours trailer: Fox Searchlight. 'Spider-Man 3' Movie: Revenge or Forgiveness? Bella Wedding Dress Behind-the-Scenes Video + 'Twilight' Series on TV?